The singer enjoyed success at the 2019 Brit Awards and has now clinched the best female artist and best British artist accolades at the second annual Global Awards. She said female success in the music industry is clear to see in the nominations women have received and follows a shift in attitudes towards women. Fellow singer Mabel also spoke about the sea change which has seen women support each other rather than compete for success. 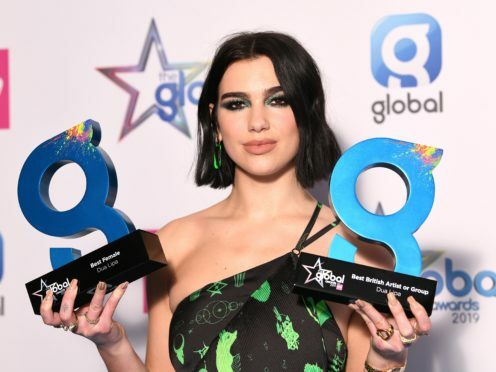 Speaking at the Global Awards, Lipa questioned why the serious attention being paid to female artists has not occurred more quickly. She said: “I don’t know why it hasn’t happened sooner. I’ve always been so in love with so many incredible female artists, I’ve always looked up to them and they’ve been there. “But I think now we’re at a time where people are really paying attention to us, and so we’re screaming real loud. Mark Ronson was another big winner on the night, claiming best male and the second ever Global Special Award. Little Mix claimed best song for Woman Like Me (feat. Nicki Minaj) and best group for the second time. Mabel took to the stage at the Apollo in London and shared Lipa’s message for young female singers. The star said that women are now more supported by their peers, and the music industry has now lost its “construct” of pitting females against one another in the battle for chart success. She said: “I never like to base success on accolades, but getting the recognition and getting up there in front of my fans and my peers, it does mean a lot, and I appreciate it so much. It makes me want to work really hard. “Just the fact that I get to wake up every day and write, and go to the studio, and make music, and be creative, has really just changed my life. I’m so grateful. Hopefully I get to do this for a while. “It’s International Women’s Day. I just think, you, it’s so sick. We’re amazing, we’re powerful. I think female voices are being heard around the world. I think every day should be International Women’s Day. “I think we’re standing together in a different way now, which makes us stronger than ever. Our voices are. Lady Gaga won the mass appeal award, while Anne-Marie scooped the award for best pop. Nicola Benedetti was named best classical artist. Rudimental won most played song for These Days featuring Jess Glynne, Macklemore and Dan Caplen. Khalid was the winner of best RnB, hip hop & grime. Joe Sugg was voted social media superstar. Kate Garraway of Smooth Radio gave out the first ever Very Award to 19-year-old Joshua Hill. The LBC Award was handed to Steve Allen.